Large scale usage of tobacco causes a lot of health troubles in human. Various formulations of tobacco are extensively used by the people particularly in developing world. Besides several toxic tobacco constituents some metals and metalloids are also believed to pose health risks. This paper describes inductively coupled plasma-mass spectrometric (ICP-MS) quantification of some important metals and metalloids in various brands of smoked, sniffed, dipped and chewed tobacco products. A microwave-assisted digestion method was used for sample preparation. The method was validated by analyzing a certified reference material. Percentage relative standard deviation (% R.S.D.) between recovered and certified values was < 5.8. Linearity value for calibration curve of each metal was 1 > r > 0.999. Improved limits of detection (LODs) were in range of ng/L for all elements. Fe, Al and Mn were found to be in the highest concentration in all types of tobacco products, while Zn, Cu, Ni and Cr were below the average concentration of 40 μg/g, and Pb, Co, As, Se and Cd were below 5 μg/g. All elements, apart from Pb, were high in concentration in dipping tobacco in comparison to other tobacco products. Generally, the order of all elemental concentration can be expressed in different tobacco products as chewing < smoked < sniffing < dipping. However, smoked and sniffing will interchange their position in the case of Mn, Cu, Se and Cd. 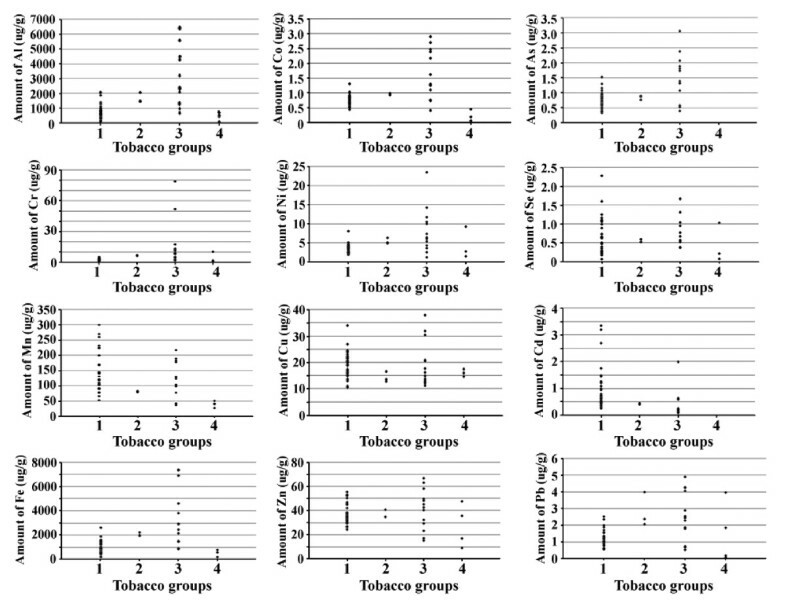 Multivariate statistical analyses were also performed to evaluate the correlation and variations among tobacco products. The present study highlights the quantification of some important metals and metalloids in a wide spectrum of tobacco formulations. The outcome of this study would be beneficial for health authorities and individuals. Tobacco use, especially in Asian countries has a long history. Five million deaths per annum, globally, are attributed to tobacco use. If this tendency continues, tobacco related mortalities will reach 8 million worldwide annually by the year 2030 . Leaves of tobacco plants are used to prepare different products including smoked (cigarettes, beedi, tobacco leaves) and smokeless (sniffing, dipping, chewing) tobacco products. The composition of tobacco is multifarious. The type and number of chemical constituents varies in its different formulations. Thousands of different chemicals have been detected in tobacco smoke; 60–70 of them are proven carcinogens . The only chemical which causes addiction in tobacco products is nicotine ; however the tobacco plant is well known to absorb trace elements from the soil and to accumulate them in its leaves on large scale. Some of these elements are toxic to human even in minute quantities [4–7]. Quantity of these trace elements in tobacco depends upon genotype, type of water, soil and their respective pH, stalk position, fertilizers, pesticides applied and the environment. Biochemical effects of toxic and trace elements in tobacco and tobacco smoke are well documented by Chiba . Among the metals, aluminum is the major ingredient in tobacco formulations. Aluminum toxicity is associated with alteration of calcium metabolism in the brain . Chromium is carcinogenic in its hexavalent form. Maternal smoking has been linked to adverse effects on selenium metabolism in the developing foetus. Such women have low polymorphonuclear cell zinc concentrations, ultimately face a threat of delivering small-for-gestational-age babies . The International Agency for Research on Cancer (IARC) has recently defined nickel as a Group 1 “carcinogenic to humans” . Copper poisoning in humans, particularly by chewing the tobacco formulation called gutka, is a major source of fibrosis in mouth cavities . Lead is more hazardous for the young ones, as its chronic exposure plays role in the lowering of intelligence quotient (IQ) levels and it is also associated with impaired foetal development . Arsenic toxicity causes skin cancer, mouth ulcerations, low haemoglobin, leukaemia, acute renal failure and nerve damages . High cadmium level is related to cardiovascular diseases . Pakistan produces more than 75 million kilograms of tobacco annually. After meeting the domestic requirement of 45–50 million kilograms, the rest of the tobacco is exported. Tobacco utilization is constantly increasing in Pakistan, India, Bangladesh and other countries of South Asia. In Pakistan, there are 22 million smokers, according to a health survey by Pakistan Medical Research Council in 2003, 36% of adult men and 9% of adult women are smokers in Pakistan  and about 100,000 people die in the country each year from the diseases caused by tobacco use. Tobacco formulations such as niswar and gutka are popular among the people of South Asia and responsible for oral cancer and its related diseases. Niswar, a sniffing and dipping tobacco product, is mainly composed of tobacco leaves, calcium oxide, and wood ash while Gutka, a chewing tobacco product, is composed of crushed areca nut, tobacco, catechu, paraffin, lime and sweet syrup. Gutka is very popular among teenagers, whilst niswar is particularly used in the Pushtoon and Afghan communities in Pakistan. These tobacco product usages are increasing at an alarming rate. Moreover sniffing, dipping and chewing products may cause metal toxicity as these products are directly consumed by the users and metals can absorb directly through the mucosal membrane. Therefore, there is an important need to quantify the metals, particularly in sniffing, dipping and chewing tobacco products. Many methods have been employed for the determination of metals in tobacco products, mainly in cigarettes [16–25]. The aim of the present work was to develop a sensitive method for the quantitative estimation of a wide range of metals and two important metalloids (As & Se) in a variety of tobacco products and to compare levels. Twelve elements, in a broad collection of Pakistani cigarette brands, niswar, sniffing niswar, and gutka formulations, were analyzed by ICP-MS using microwave digestion. International cigarettes and niswar formulations were also analyzed for a comparison of metal and metalloid’s toxicity of local and imported tobacco products. Moreover, the present study will be helpful to pick dietary intake values of these metals and metalloids, so that one can assess the risk of overdosing of these metals and metalloids. It is the first report for the determination of metals and metalloids in a wide range of tobacco products and it will be useful for health and environment authorities in Pakistan and other countries of South Asia. Nitric acid was of trace metal grade and was purchased from Thermo-Fisher, USA. ICP-MS verification standard (Tune-A) and multi-element calibration standards were purchased from Ultra Scientific, USA. Deionized water from Milli-Q system (Millipore, Bedford, MA, USA) was used exclusively. Samples were digested using the Microwave Accelerated Reaction System and associated Teflon microwave vessels (CEM Corp, Matthews, USA, X7-Series). Elemental analysis was performed using Thermo Elemental X7 Series ICP-MS System coupled with Cetac ASX-510HS high speed auto sampler (Omaha, Nebraska 68144 USA). Argon gas cylinders were connected through a six cylinder gas manifold from Western Innovator (Ohio, USA). Samples were centrifuged by Eppendorf micro-centrifuge (Hamburg, Germany). Fifty five different brands of tobacco smoked, sniffing, dipping and chewing products, commercially available in Pakistan, were purchased from various markets of Karachi. Each product was purchased twice, having different batch numbers and packing dates from different shops and stored in plastic bags separately. Envelope, paper and filters were carefully removed from the cigarettes and weighed amounts of duplicate samples were pooled and crushed in liquid nitrogen with pestle and mortar. Fine powdered samples were air-dried and stored at – 4 °C in polythene bags until use. Sniffing, dipping and chewing samples were processed similarly and stored. All samples were coded and their decoding details are available in the Additional file 1. Samples (10–30 mg) were weighted directly into micro-vessels and 1 mL of nitric acid was added. After five minutes, vials were capped using a torque wrench of capacity 20 in-lb (≅ 2.26 Nm) with a 22 mm socket. 10 mL of water was added into each HP500 plus standard digestion vessel. Two Teflon reaction vessels were inserted carefully in each digestion vessel. The micro-assisted digestion parameters were as follows: max power 600 W, ramp time 10 min, pressure 350 psi, and temperature 130 °C for 10 min. Upon completion of the digestion process, vessels were allowed to cool at room temperature for 30 min. Digested materials were transferred to Eppendorf tubes and centrifuged at 10,000 rpm for three minutes to remove any undigested material. Digested materials (200 μL) were diluted in 9.8 mL of deionized water in 15 mL tubes and then analyzed by ICP-MS. To avoid contamination of samples, all PTFE material (Teflon vessels, pipettes, micro pipettes, tips and autosampler cups) were immersed in freshly prepared 15% v/v HNO3 for 2 h before analysis, then rinsed thoroughly with deionized water and dried in a dust free area before use. The blank digests and filtered residues went through a similar protocol of sample preparation and all samples were blank-corrected. In the case of filtered residue extracts (filtering), the concentration of most elements were below detection limits and in exceptional cases very close to the detection limits, indicating that metallic contents staying behind in undigested material had negligible significance. Multivariate statistical analysis can help to interpret data in a much easier and understandable manner. In the present study, simple XLSTAT (version 2011.4.04) was used for three multivariate techniques. There were 12 columns expressing elements and 55 rows indicating individual products. For a detailed statistical evaluation, principal component analysis was done on the whole data. It was done by diagonalizing the correlation matrix and all values were set at maximum unit variance, so the difficulty in analyzing different ranges of data points was avoided. The variability of the whole data was projected onto a scale, dividing variance into sub classes called principal components or factors. Moreover, Q-mode factor analysis after Varimax rotation was performed to check the variability among the tobacco products. Where SDblank is the standard deviation for the signal recorded on the blank for the corresponding element studied, Concn.sample is concentration in μg/L of the respective sample aspired, Inet = [Isample – Iblank], Isample& Iblank are the signal intensities recorded for the sample and blank, respectively. The LODs for all metals are summarized in (Table 2). Moreover, all samples above their LOD can be quantified, if their quantification limit would be approximately ten times the limit of detection. aStandard deviation of twelve measurements; bCounts per second. Recoveries of target elements were computed by comparison of microwave-assisted digestion data against certified reference material (CRM) values. 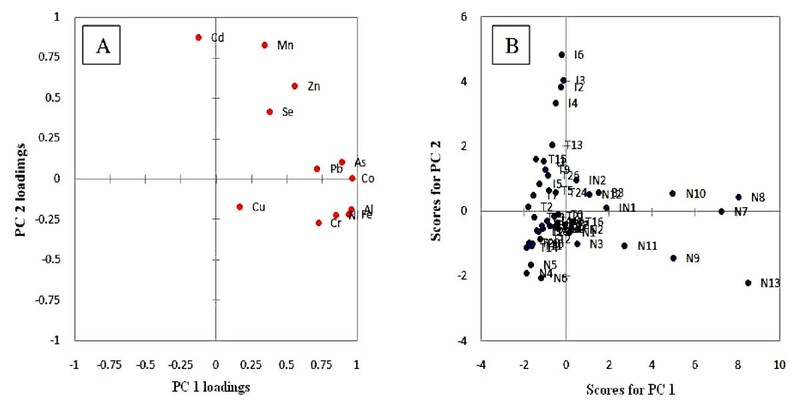 Results showed that there was a good agreement between the recovered and certified values of the metal and metalloid contents in certified reference material. Percentage recovery of all elements was 96.1 < M < 108.5%, while percentage relative standard deviation (% R.S.D.) was < 5.8 in all cases. % Recovery of metal and metalloid content as evaluated by comparing the recovered and certified values is summarized in (Table 3). a Information value; b ng/g; c Not available; d Below detection limit. Thirty-five samples of tobacco smoked products, including 26 Pakistani, 6 foreign brands of cigarettes, 2 brands of beedi and tobacco leaves (used for hookah smoking) were investigated for the quantification of metals and metalloids by the developed method. Iron and aluminum were the major elements among the all analyzed elements and were found in the range of 190–2600 and 150–2100 μg/g, respectively. Mn was in the range of 53–300 μg/g as the third most abundant element in all smoked tobacco products, while Pb, Cd, Se, Co, and As were present in < 3.4 μg/g. Fe and Al having similar a range in national and foreign smoked brands, but their quantity was high in beedi samples. Foreign cigarette brands contain more Mn and Zn contents as compared to other smoked tobacco products. There was no significant difference in Ni contents of different types of smoked tobacco products. As and Cd have almost similar levels in different smoked tobacco products. Se was found in trace quantities in all tobacco smoked products and it was below the detection limit in some cases. Pb contents have similar trends in Pakistani cigarette brands, but in the case of foreign brands there were variations in its concentration. Metal and metalloid contents in all tobacco products are summarized in (Table 4) and graphically presented in Figure 1. Amount of element μg/g ± S.D. Graphical presentation of metals and metalloids contents in smoked 1, sniffing 2, dipping 3, and chewing 4 tobacco products. Three local samples of sniffing tobacco (sniffing niswar) brands were investigated for the quantification of metals and metalloids by the proposed method. Fe, Al and Mn were the most abundant elements and present in higher concentrations in comparison to tobacco smoked products. Mn was found in the range of 79.2-83.6 μg/g, and lower in concentration in comparison to tobacco smoked brands. In the sniffing tobacco products, Pb was found in the range of 2.07-3.99 μg/g, more than that of smoked tobacco products. Cd was the minor trace metal, while Se was below the detection limit in sample N3. The results are presented in Table 4 and Figure 1. Ten local and three foreign samples of dipping tobacco (Niswar) brands were analyzed. Fe, Al and Mn were the principal components also in dipping tobacco samples. Fe and Al were found in the ranges of 840–7400 and 670–6500 μg/g, respectively. Most of the dipping tobacco samples contained higher concentration of metal and metalloids than all other types of tobacco products, except Mn, Se and Cd. No significant difference of elemental contents was observed between local and imported dipping tobacco products except in two Pakistani products, N7 and N8 (Table 4) and Figure 1. Four brands of gutka (a chewing tobacco product), which is commonly consumed in Pakistan, were investigated. Generally, they contained metals in fewer quantities, except Cr, Ni, Cu, Zn and Se. Three major elements Fe, Al and Mn, showed similar trends, to that observed in other tobacco products. A gutka sample, G2 had Cr and Ni in concentrations of 10.44 and 9.27 μg/g, respectively, more than smoked and sniffing tobacco brands. Similarly, the amount of Cu (17.5 μg/g) in G2 was higher than the sniffing tobacco products. The amount of Zn (47.72 μg/g) in G3 was more than in the sniffing tobacco brands. Se (1.03 μg/g) in G1 was more than the sniffing tobacco products, while Co was below the detection limit in the same sample. As and Cd were below the detection limit in all chewing tobacco brands. Results are summarized in Table 4 and in Figure 1. Codes of all samples have been decoded in Additional file 1: Table S1. A mean value of all analyzed samples from each category of tobacco products was calculated for various elements and a log-scale comparative graph was drawn Figure 2. The decreasing order of elemental concentration can be summarized as Fe > Al > Mn > Zn > Cu > Ni > Cr > Pb > Co > Cd > As > Se for smoked tobacco products, Fe > Al > Mn > Zn > Cu > Cr > Ni > Pb > Co > As > Se > Cd for sniffing tobacco products, Fe > Al > Mn > Zn > Cu > Cr > Ni > Pb > Co > As > Se > Cd for dipping tobacco products and Fe > Al > Mn > Zn > Cu > Ni > Cr > Pb > Se > Co > As > Cd for chewing tobacco products. Sniffing, dipping and chewing products are different from the smoked products due to their direct contact of tobacco into mucus membrane and metals can be absorbed through mucosal membrane. The recommended dietary intake of metals and metalloids [26–28] is highlighted in the Additional file 1: Table S2. The situation is really alarming as the single dose of these tobacco products is between 2–10 g, while the number of doses consumed per day mainly depends on the level of tobacco addiction of the user, this would be an additional amount of metals taken by the consumer excluding other environmental and nutritional sources. 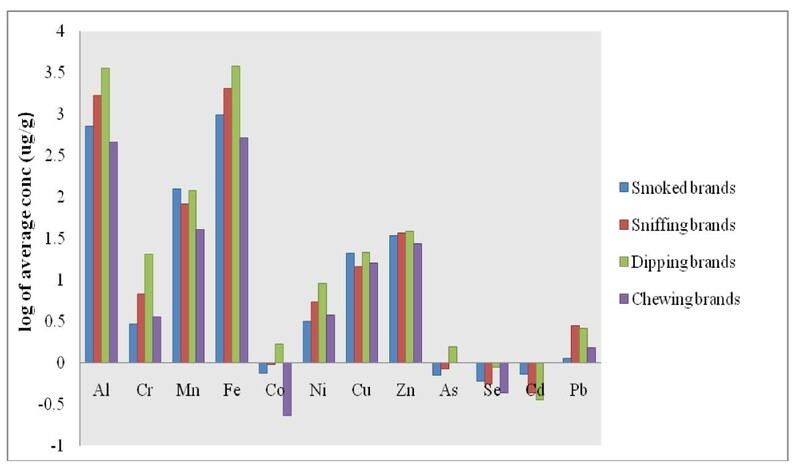 Graphical representation of average concentration of metals and metalloids in various tobacco groups. Many researchers have quantified the metal contents in smoked tobacco products, particularly in cigarettes . We have compared our data with the reported literature of smoked tobacco products from Pakistan (Table 5). Limited literature is available about sniffing and chewing products and only from India. However, to the best of our knowledge, no report exists about metal contents in dipping tobacco products. In smoked products, our study showed that Mn, Cu and Zn were higher; Cd has comparable concentration, while Co and Pb were lower than the reported concentrations from Pakistan . In the case of sniffing tobacco, most of the metallic contents are nearly comparable with the existing data , while Mn was found to be lower and Pb as reported by U.C. Mishra et al. was reasonably high among all the reported studies. In case of chewing tobacco, our results showed a little lower concentration of Cr, Mn, Fe and Pb, when compared with existing literature [29–33]. Only one report exists about the quantification of the metalloid, Arsenic, in a chewing tobacco product, but As levels were below the detection limit in our case. The present work is the latest source of information with reference to metals and metalloids contents in tobacco products, especially smokeless tobacco formulations. As the principal component analysis is based on Eigen values of correlation matrix, a detailed discussion on correlation matrix is useful in divergence or coherence of data. Data points, whose concentrations were below the detection limit, were replaced by half of detection limit values for the statistical evaluation. Values higher than 0.50 were considered to correlate the data points (Table 6). Positive values in the table show positive correlation among variables while negative values show negative correlation. Values closer to 0 indicate poor negative or positive correlation. However, values nearer to 1 show significant correlation. Neither pairs of elements showed significant negative correlation between them, however, Cu showed no appreciable correlation to any of the element analyzed. Hence, it was placed in a separate group. The remaining elements were easily grouped in two distinct classes after interpretation of the correlation matrix and are: Group 1 = Al, Fe, Co, Ni, As, Cr and Pb, Group 2 = Mn, Zn, Se and Cd, Group 3 = Cu. Grouping of the data is further elaborated through a multivariate analysis i.e. principal component analysis. Values in bold show absolute values greater than 0.50. Principal components having Eigen values greater than 1 were extracted for this study. This generated four independent components. The first component contributed as 49.1%, second 18.4%, third 9.3% and fourth 8.7% variability of the data. Total contribution from these four components is 85.7% of the total variation (Table 7. Analysis of Table 7 shows that elements of group 1 gave a major contribution to principal component 1. The second group of the correlation matrix significantly contributed in factor loadings of principal component 2. While a unique trend for Cu was again observed. It showed a significant appearance in principal component 3 and no other element appeared in that factor. This grouping was also clearly apparent in the diagram of loadings of components 1 and 2 (Figure 3A). This figure showed a total of 67.56% variance of the data, while, Figure 3B showed the score plot for the first two components. A = contribution of each element to the PC loadings and B = principal component scores for tobacco products. 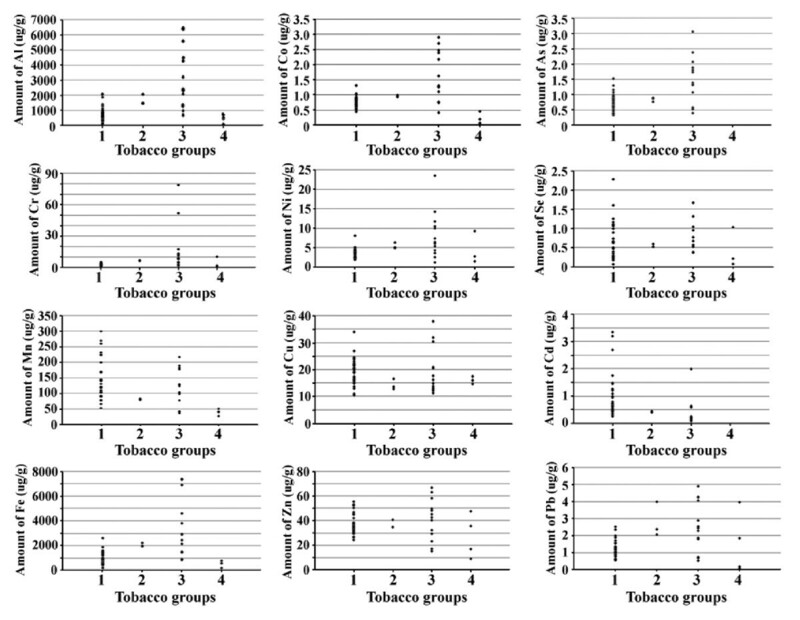 The 55 different tobacco products were subjected to Q-mode factor analysis. This analysis generated many factors, but among them, only two were produced after Varimax rotation. These two factors accounted for 64.7% of total variability (Table 8). The first factor with 44.8% variability was considered to be a major factor. This factor may depend on the processing procedure. As a majority of the smoked tobacco products (either local or international) have low loadings in factor 1 and all the smokeless products have high loadings in factor 1 it can be concluded that smokeless tobacco products undergo many processing steps and thus they have more chance of elemental contamination. The smoked tobacco products undergo fewer processing steps, hence majority of them gave high loadings in factor 2. 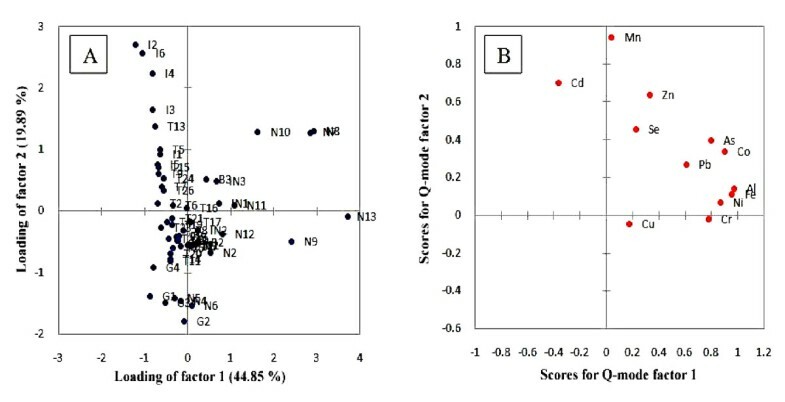 Figure 4A and B showed the loadings and scores plot of factors 1 and 2 for the Q-mode factor analysis, respectively. Values in bold show samples with low loadings in Factor 1 but high loadings in Factor 2. A = plot of Q-mode factor loadings and B = plot of Q-mode factor scores. This study focused on ICP-MS based quantitative estimation of metals and metalloids in various tobacco products. The method was validated by analyzing certified reference material. Good agreement between recovered and certified values showed effective recovery of the metals after microwave digestion and subsequent accurate detection. The limits of detection for all twelve elements ranged between 0.001-5.23 ng/L, which were much better when compared with the studies reported in literature. The average observed concentration ranges (μg/g) of metals in all types of tobacco products were Al (111.27-6500), Cr (0.69-78.8), Mn (27.37-300), Fe (176.96-7400), Co (0.06-2.9), Ni (1.19-23.5), Cu (10.5-37.9), Zn (9.15-66.9), As (0.33-3.07), Se (0.062-2.28), Cd (0.093-3.35) and Pb (0.08-4.9). The present study provides reliable data about the metals distribution in some commonly consumed tobacco products. Hence, this study would be helpful for toxicologists and environmental chemists to evaluate the health effects of tobacco products and their contribution towards overdosing of the metals in tobacco users. We gratefully acknowledge the cooperation of Jiri Mizera from “Nuclear Physics Institute of the Academy of Sciences of the Czech Republic (ASCR)” for furnishing us with certified reference material (Oriental tobacco leaves, CTA-OTL-1). This research was made possible, in part, by the RI-INBRE research core facility, supported by grant# P20RR16457 from NCRR, NIH. SGM: Participated in the experimental designing and method optimization. MS: Participated in bench work and played a role in paper writing. AJS: Involved in statistical evaluations. MNH: Involved in the useful discussion and participated in paper writing. AA: Involved in the useful discussion and participated in performing experiment. All authors read and approved the final manuscript.